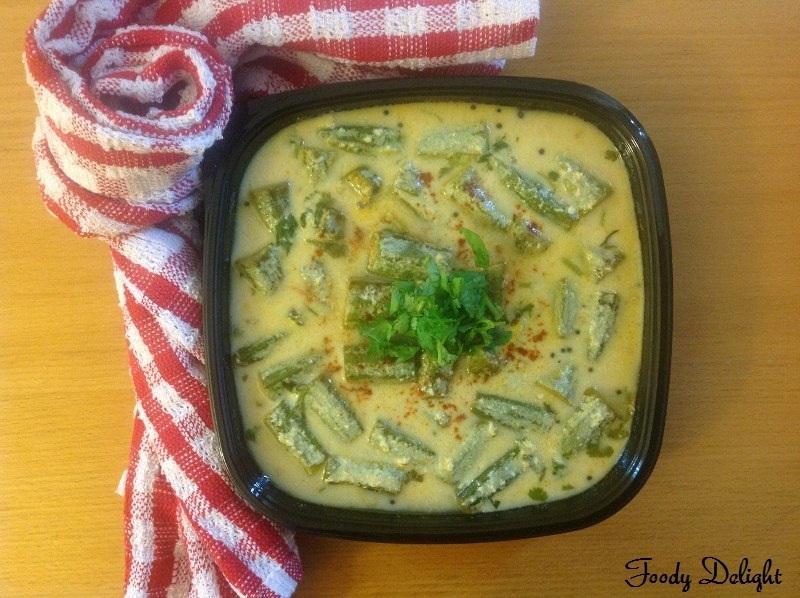 Dahi Bhindi is the gravy prepared with okra(ladyfingers) into the yogurt based gravy. The shallow fried okra for this gravy gives a rich and unique taste to the gravy. Dahi bhindi can be served with chapatis or with plain rice. You all should once try this easy and healthy curry. Wash the okra throughly in the water and dry them completely before you cut them. Then cut the okras into 1 inch of pieces. Combine cut okra, red chilly powder, coriander - cumin powder, tumeric powder and salt in one bowl. Mix well and keep aside for 5 minutes. In another bowl, combine yogurt, red chilly powder, sugar , salt and chopped cilantro. mix well and keep aside. Heat the oil into non stick pan . Add okra mixture and toss well. Cook it till is it done. Remove the fried okra and add it into yogurt mixture. To prepare the seasoning, into the same pan, add oil if required. Add mustard seeds, curry leaves and asafoetida. Saute them for 1 minute and add it to the yogurt mixture. I often add yogurt while cooking bhindi, but never have had it in a yogurt based gravy properly.. A must try in my list since I love Okra..